This article is about the "Quartier Latin" in Montreal. For the area in Paris, see Latin Quarter, Paris. For other uses, see Latin Quarter (disambiguation). Terasses on Saint Denis Street. 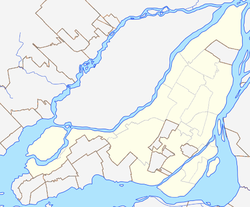 The Quartier Latin is an area in the Ville-Marie borough of Montreal, surrounding UQAM and lower Saint-Denis Street, between downtown and the Gay Village. It is known for its theatres, artistic atmosphere, cafés, and boutiques. The Grande Bibliothèque du Québec was opened in the area in 2005, joining the Cinémathèque québécoise as a key cultural attraction. The National Film Board of Canada's CinéRobotheque facility was based here until April 2012, when it was closed as part of cuts imposed by the 2012 Canadian federal budget. This area falls within the boundaries of the new Quartier des Spectacles entertainment district, now being developed. ^ "NFB to cut 61 jobs across Canada". CBC News. 4 April 2012. Retrieved 4 April 2012. Wikivoyage has a travel guide for Quartier Latin - Le Village. This page was last edited on 13 January 2018, at 22:49 (UTC).